I was provided with a copy of Simply Citrus as well as a copy for this giveaway. All opinions are my own. Please note that this post also includes affiliate links. Should you choose to purchase the books I recommend, I may receive a small commission that helps keep Diversivore running. Thanks! If you know me at all, you know I LOVE citrus. Ell-Oh-Vee-Ee. Citrus holds a special place in my heart for quite a few reasons. When I first started building Diversivore I used a few citrus varieties and recipes as building blocks and test pages. I did a lot of research on citrus as I figured out exactly what I wanted to write about here, and how I wanted to communicate with the world, and my fascination has only grown. I also love the taste of citrus. It’s a perfect addition to countless sweet and savoury dishes. I mean, can you imagine fish without lemon? Or a world without key lime pie? But perhaps most importantly of all, I feel like the bright, sunshiny, sweet-sour taste of citrus really adds life and colour to the colder winter months. It’s a little beacon of culinary hope, reminding us of the brightness and colour that will come our way in a few months, if only we can wait. Needless to say, when the chance arose to read, review, and give away a copy of Simply Citrus by the wonderful and talented Marie Asselin came my way, I jumped at the opportunity. And boy am I glad I did. Simply Citrus is a gorgeous, creative, and thoughtful cookbook dedicated to a wide variety of citrus-based delights. Lemon, lime, orange, mandarin, grapefruit, pomelo, kumquat, yuzu and more are covered in the book’s 128 pages, with recipes running the gamut from Citrus Hummus to Lime, Ginger, and Coconut Ceviche, to Grapefruit Upside Down Cake. As you might expect from Marie and her incredible, award-winning blog Food Nouveau, the desserts are jaw-dropping. Honestly, all the food is amazing, but Marie has a particular penchant for making dessert look simultaneously fancy and approachable. The Mandarin and Raspberry Ricotta Tart makes me want to lick page 95. Probably shouldn’t do that though (memo to self: scratch-and-sniff cookbooks?). “Alright,” you say, “If the desserts are so amazing, why did you make tacos?” Simple, my friends. 1). Tacos are amazing, and you’re crazy if you think that desserts trump tacos. 2). I already know how amazing Marie’s dessert-making skills are and I wanted to try something else. 3). When I make dessert, I have the added stress of trying to keep two ravenous little monsters (whom I love dearly) from trying to eat it for every meal. The recipe itself is delightful. Spiced fish (I used chum salmon, but it will work marvelously with all kinds of fish) pairs perfectly against the mellow and sweet/sour grapefruit and avocado salsa. I used whole wheat tortillas as called for by the recipe, but this would be wonderful in corn tortillas too. It’s easy to make and quick to boot, which is always a plus when it comes to scratch cooking. It’s also a great example of just how versatile grapefruit can be. Despite being a common and well-known citrus fruit, I feel like grapefruit doesn’t get the culinary attention it deserves, especially in savoury settings. I don’t need to go into too much detail here, but I’ll contribute a couple of little pointers from the book along with some of my own thoughts to help anyone looking to try-it-before-you-buy-it (or win it!). You can go in any number of directions with the fish in this recipe, making this a delightfully versatile meal. I had some chum (keta) salmon that I wanted to use up and it was wonderful. That being said, a firm white fish like cod, halibut, bass, tilapia, or barramundi would also be lovely. While I haven’t tried it myself, I also think that shrimp would be a fantastic option here, and certainly a nice pairing with the avocado-grapefruit salsa. All of the spices are easy to find, so there shouldn’t be any specialty shopping trips in your future. I did find that the it was a bit easy to accidentally get a bit too much spice rub on one piece of fish, making for a few over-spiced and over-salted bites, so I would recommend dusting and gently rubbing the fish in the spice mixture rather than dipping/rolling it like I did. As for the citrus, white or pink grapefruit will both work beautifully. We’re at the end of pomelo season right now and those would work beautifully here too. Some of pomelo hybrids (e.g. melogold and oro blanco) would also work very nicely. Because you’re broiling the fish, you want to keep a close eye on your oven. The fish will cook fast and you don’t want to overcook it. I recommend pre-prepping the grapefruit (peeling, segmenting, and chopping) as this part can be a little bit trickier. The other salsa steps can be done while the fish is cooking to make the most efficient use of your time. I pretty much always recommend that people adjust their taco toppings to their tastes, but in this case I would urge you not to veer too far away from the serving suggestion. The added Greek yogurt (or sour cream) adds a rather welcome creamy/tangy hit that you’d really miss otherwise. You can adapt the greens to whatever you happen to have on hand, but cilantro is always a favourite for me (not so much for those of you genetically pre-disposed to thinking it tastes like soap though). The salsa is, obviously, essential. Which is good, because it’s amazing. If you make extra you won’t be sorry. Woop, giveaway’s all done. Sorry about that. Want to make sure you know about any future giveaways (not to mention recipes, posts, and more)? Why not sign up for email notifications! No spam – well, unless it’s in the recipe. You know what I mean. Note: information shown is for a single taco with a whole wheat tortilla and toppings. GOOD NEWS:Ahh, lots of good news! Nutrient-dense, protein-rich, low in fat but with lots of good fats… it’s a wonderful, delicious, and healthy meal! BAD NEWS:The spice mix leaves this a bit high in salt. Beyond that, this is healthy, delicious, nutritious stuff. Make sure not to accidentally inflate your calorie count by using gigantic tortillas (those burrito tortillas are surprisingly huge). Beyond that, you’d have a tough time going wrong here! CUT THE SALT: The salt is an important part of the spice rub for the fish, but you could cut it in half and then season to taste at the end. I personally tend to err on the less-salty side with my food in general, so this is the approach I’d take if I was remaking this recipe. Rich, creamy brie, topped with a spectacular combination of walnut, apple, caraway, honey, and a little lemon. Ready in 15 minutes, so what are you waiting for? Golden kiwis are used to great effect in this dish of seared halibut cheeks with a sweet/savoury puree, avocado and macadamia tartare, and black rice. Salad rolls get a simple but spectacular twist by swapping out rice noodles for pomelo. It sounds odd, but it's amazing - and best of all, incredibly healthy. A West-coast take on a Québécois classic, this amazing sandwich features homemade salmon salad and scratch coleslaw in a grilled bun. Saffron-cardamom simple syrup, grapefruit juice, a rose-scented sugar rim, and brut sparkling cava make for a unique, elegant, yet surprisingly simple cocktail. In this recipe, the fish is coated in aromatic spices and broiled in just a few minutes - just the time it takes to assemble the zesty salsa. Reprinted with permission from Simply Citrus by Marie Asselin (Gibbs Smith, 2018). In a large bowl, whisk together the olive oil, honey, cumin, and salt. Add the avocado, grapefruit, onion, and jalapeño. Toss to coat and set aside while you prepare the fish. Set a rack in the upper third of the oven and preheat the broiler on high. Cover a baking sheet with aluminum foil and lightly coat with oil. In a bowl, combine the chili powder, oregano, salt, and pepper. Add the fish and rub the spices all over. Transfer to the prepared baking sheet. Lightly spray the fish with cooking spray. Broil just until the fish is cooked through and charred in spots, 5-7 minutes, depending on the fish you're using. To serve, smear the tortillas with some Greek yogurt or sour cream. Add some broiled fish and a few spoonfuls of salsa. Garnish with microgreens, green onions, and cilantro. I love a simple, yet delicious lemon meringue pie. Actually, citrus is good but n almost everything! One of my favourites is lemon pepper chicken wings. My childhood will never let me forget about my love of anything orange and creamy-like. Orange creamsicles ❤️. Also, orange and chocolate anything is always at the top of my list! I havn’t thought of making fish tacos for a long time!! Why not though eh!? They seem like they would make a great weeknight supper. As long as the salsa is made ahead of time, broiling the fish wouldn’t take to long! Who can resist fish tacos – but my favourite citrus recipes are cakes and salads! Lemon loaf with coffee or tea and lemon drop martinis with friends! I love making lemon muffins with jam on top. I love citrus in savory dishes! The tacos turned out gorgeous! Life would, indeed, be so sad without citrus! I’m a huge citrus fan too! When in doubt, add citrus!!! These tacos look divine! Really hope I win this cookbook! One of my favourite citrus recipe is a lemon cream pie. So delicious. Sweet with that hit of lemon citrus! You can’t go wrong with tacos! The salsa sounds divine – I love grapefruit! Welp—you know I’m ALL about the fish tacos! Especially with a fruit and punchy salsa! I’ve been wanting to incorporate more grapefruit into my fish dishes, so this has got me excited! It sounds so bright and refreshing! I love Marie’s work and would love a copy of that book. I’m sure it’s *full* of goodies! My goal in the next year or so is to fill my shelves with cookbooks by bloggers, actually. The recipes are much more approachable than a lot of the Food Network stars’ books. I’ve recently begun to really love savory citrus dishes. This looks amazing! Fish tacos are my favourite. I usually do a pineapple and avocado salsa, but a grapefruit version sounds amazing. This salsa sounds amazing, especially with fish tacos! Oh, how I wish I wasn’t allergic to grapefruit because this recipe looks to die for!! I HAVE to go to the store fast and get some tilapia. These look so good! I’m a big fan of fish tacos! 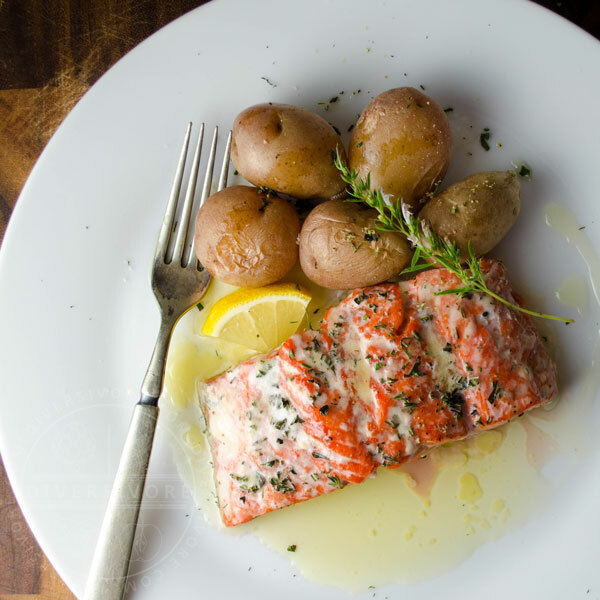 My fave citrus recipe would be roasted citrus butter salmon on a bed of steamed rice.